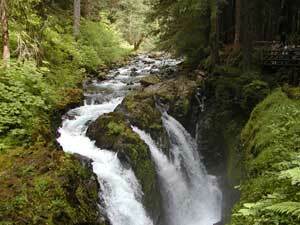 There are a lot of hikes from the Sol Duc Falls trailhead. You can follow the river up the valley or take a side trail up to the High Divide. If you aren't much of a hiker, you can just walk to the falls and back and the whole thing is worthwhile. To be honest, we have barely begun to explore the possibilities. 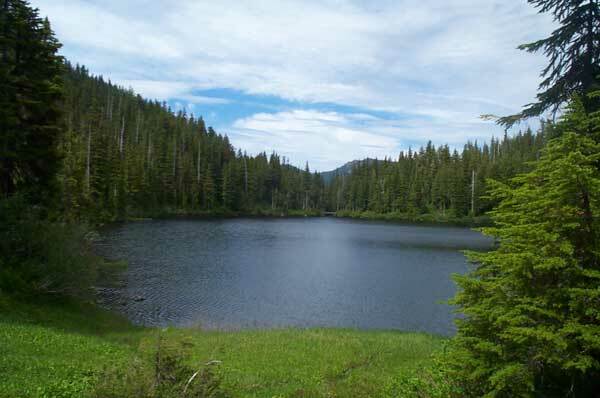 Every time we go to Sol Duc, we walk past the falls and up the side valley to Deer Lake. If the snow has melted enough, we head higher to The Potholes. Then, we eat lunch and turn around and head back. Take Route 101 west past Lake Crescent and go up the hill. The Sol Duc Road turn off is near the top of the hill. Go past the Park Ranger station and go to the end of the road. If you want, you can stop off a the Sol Duc Hot Springs Resort, which has food, clean bathrooms, lodging and sulfurous hot springs. The Sol Duc Hot Springs Resort has a website. Sol Duc Falls is a short walk from the trailhead and is definitely worth seeing. From the bridge you can see the full power of the falls, hear the roar of the water through the rocks and feel the spray and thunder. 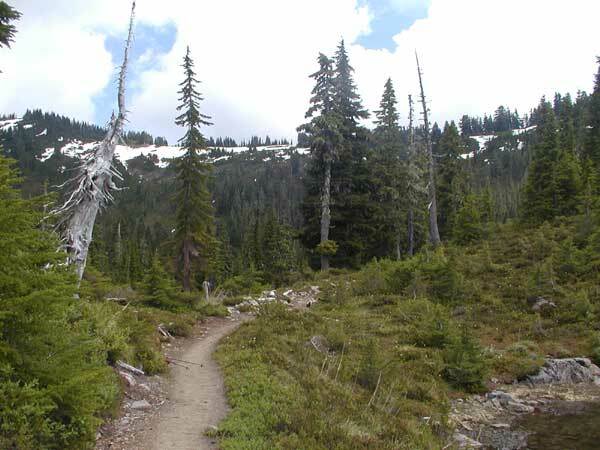 It is usually worthwhile to check the trail conditions, particularly in the shoulder season. 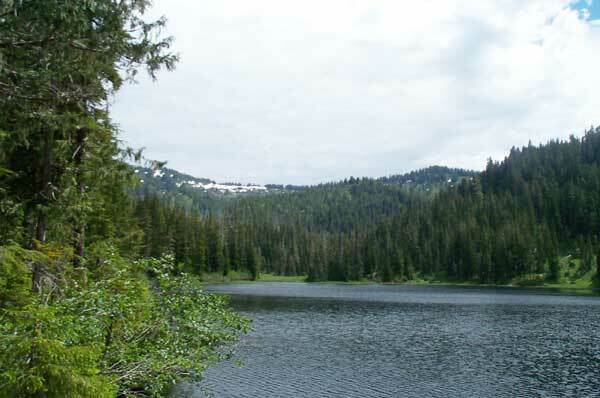 Deer Lake is a serene place. The first view from the river crossing is always welcome after the climb. Starting from the Sol Duc Falls trailhead, head into the rain forest towards Sol Duc Falls. Cross the bridge at the falls and enjoy the roaring blue-green water as it blasts downstream beneath you. Then head right, following the stream a bit. So far, the trail is easy going, but the climbing starts just after the Lover's Lane Trail forks off, perhaps a half mile after the falls. 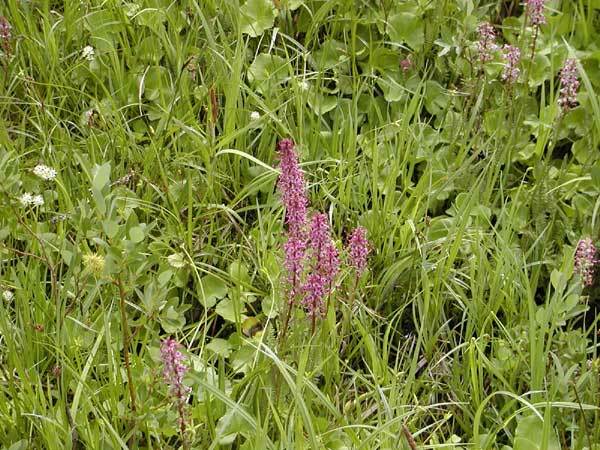 Now the going gets rougher and you will be glad you wore proper hiking shoes and taken your hiking sticks, because there are lots of awkwardly placed rocks underfoot. The trail is pretty enough here, but it starts being something special when you reach the canyon bridge. 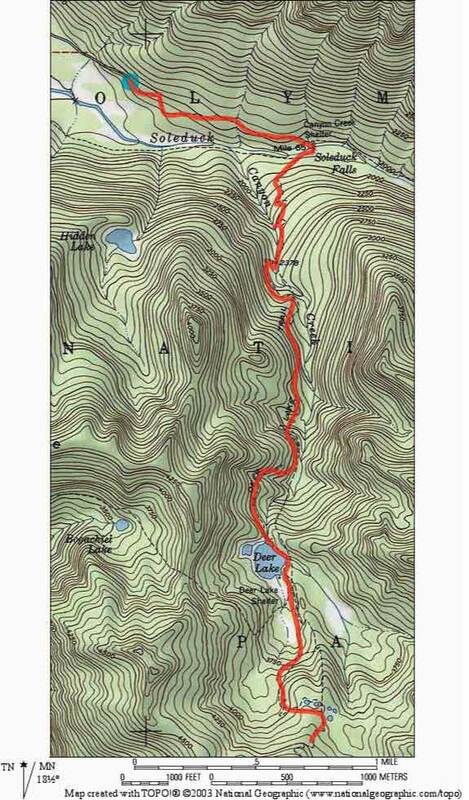 Here you meet the stream that will be your companion for the climb, and here you can get a feel for the climb out of the Sol Duc Valley you are undertaking. From here on, you will never be that far from the stream with its wild rapids, waterfalls and comforting roar. 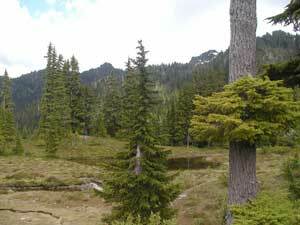 Up the rocky switchbacks, through the evergreen forests and up into a new world you go. Mind you, this trail can be hard going, but the 1500' climb is worth it. We were once struggling with the meaning of our existence as we climbed this trail, rock strewn and cougar infested, but then we ran into a twelve year old girl carrying a pack that probably weighed as much as she did. She was barreling along and we took heart. After all, we weren't going to let an overburdened twelve year old make us look like fogies. But, even she started to falter. "Where is this lake anyway? ", she asked existentially. But by now, we were at 1400', so it was we, older and wiser, gasping and wheezing who offered HER hope. We had a digital altimeter and had checked the guidebooks, so we reassured her that there were only another hundred feet to climb. Amazingly, the guidebook had been correct and the altimeter not far from the mark. We were indeed soon at the lake. There it was in alpine splendor, surrounded by snow, even late in the summer. It was gorgeous. It was breathtaking, that is, if we had had any breath left. We had to come back, and we have many times. 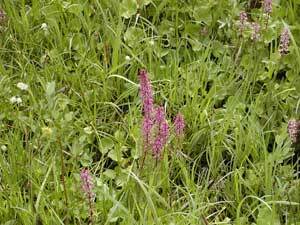 On our last visit it was surrounded by wildflowers and we took the walk around the lake which leads through forest and swamp, offering a variety of views to enjoy and habitats to explore. If you still have any strength, you might want to continue onward. 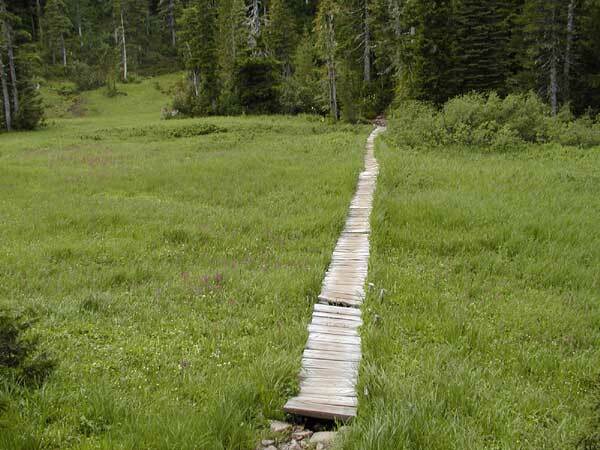 Follow the trail, about 1/.4 the way around the lake, that leads on to the High Divide Trail (not towards Mink Lake). 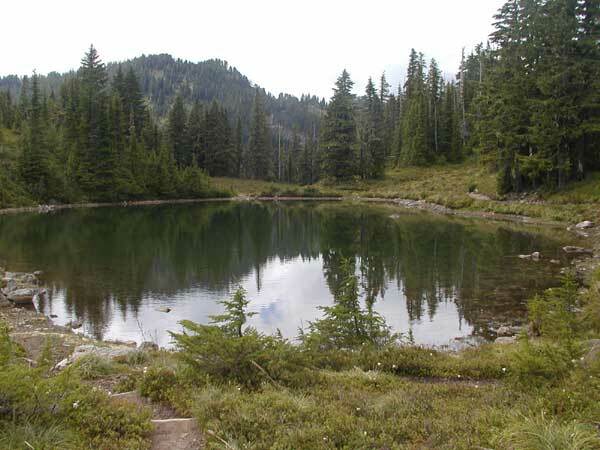 This ascends rapidly, but with better footing, than the original climb to Deer Lake. After you have climbed another 500' or so, you will start seeing the potholes, a series of ice melt lakes, in the most amazing settings. 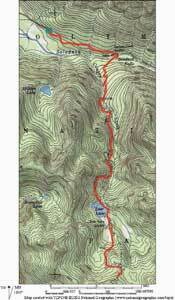 Click above for a trail map produced using National Geographic's TOPO program.